The ADN program requires two years of full-time study and culminates with successful passing of the NCLEX-RN national licensure exam. Candidates study important subjects like anatomy, physiology, pharmacology, health promotion, and the social sciences. The ADN curriculum is rigorous: in addition to 10 to 18 hours of class per week, students spend time in a nursing skills laboratory and at clinical practice sites. They must also complete weekly tutorials and essays. Some schools offer evening classes to accommodate working students with existing job (and family) commitments. The ADN program is intense and demanding, but it provides numerous employment opportunities. 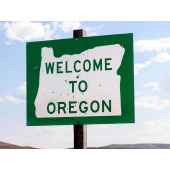 Oregon’s RNs earn very attractive pay, typically between $65,000 and $95,000 annually. They are also recognized for their clinical knowledge, patient care management, teaching, and leadership – skills which open doors beyond the medical arena. Oregon has over 15 accredited nursing schools with a state-approved ADN program. Most are offered by the state’s network of community colleges, including Portland Community College, Chemeketa Community College in Salem, and Lane Community College in Eugene. Some schools offer direct non-competitive admission to BSN programs at universities. Interested in the fastest path to RN licensure? We’ve provided below a complete list of Oregon’s ADN programs, including students’ recent NCLEX test scores where available.